Our concept is EAST MEETS EAST IN THE WEST® which is a blend of teachings from Yoga schools, the holistic community, various fields of medicine, Chinese medicine, TaiChi and Qiqong to develop unique principles to deliver a well-balanced practice to healers & practitioners. For Yoga students who wish to teach yoga classes or just simply wish to know a lot more about yoga. 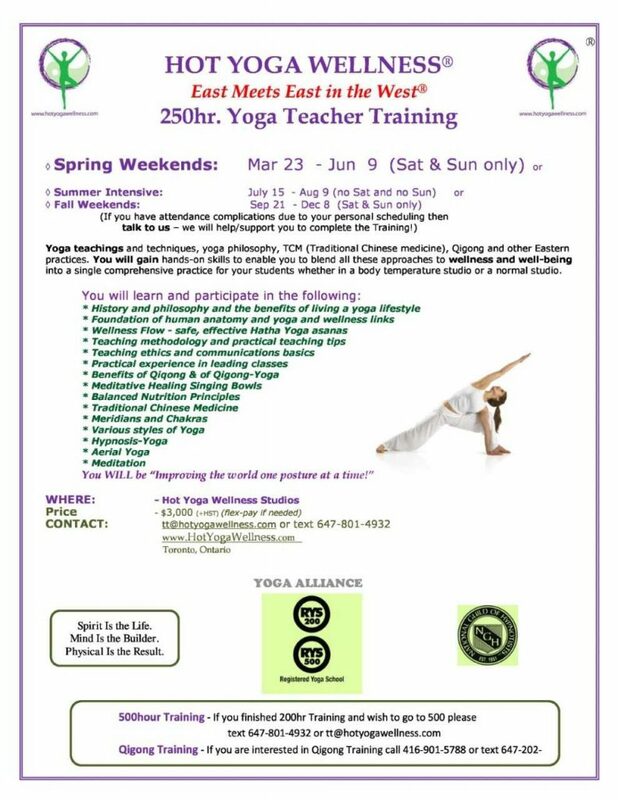 For more information re the 250hr Teacher Training: 250hr Yoga Qigong Teacher Training 2019. We are an accredited member school of the International Association of Yoga Therapists. We respect your finances: Favourable payment terms if needed. certified by Yoga Alliance, Canadian Yoga Alliance and is fully accredited by the International Association of Yoga Therapists (IAYT*). You will learn a lot AND you will have a great time. * We are delighted that IAYT has granted accreditation of our yoga therapy program. A blend of teachings from Yoga schools, Chinese medicine, TaiChi and Qiqong to develop unique teaching principles to deliver a well-balanced practice to practitioners. You will get insights into the foundations of Yoga philosophy and teaching techniques plus you will be given a solid overview of Chinese medicine and other Eastern practices. You will gain hands-on skills to enable you to blend all these approaches to wellness and well-being into a single comprehensive practice for your students whether in a body temperature studio or a normal studio. Teacher Training Application form, please see our teacher_application. For 200hr RYTs who want to become Yoga Therapists and work with Healthcare professionals. For all medics who wish to incorporate the benefits of yoga therapy in their healing practice. We are an accredited member school of the International Association of Yoga Therapists (IAYT). Maximize benefits and safety through knowledge of anatomy, physiology and kinesiology. Deepen your knowledge of teaching postures in more ways with advanced asanas. Teaching methodologies, class designs and various sequencing approaches. Yogic meditation including physiological and psychological techniques. Gain extensive practice one-on-one with your students/clients. Yoga Cosmology, Philosophy, Psychology & the Chakras. Ayurvedic Medicine Pathophysiology for Chronic Pain. Develop skills for working with special needs groups. Arthritis, Osteoporosis, Fibromyalgia and Diabetis. Suitable for normal temperature or hot room. Restorative Yoga & Yoga Nidra. Health Qigong Da Wu, as taken from Chinese ancient literature, focuses on the bending, stretching, rotating & revolving of all joints in the body. This set of exercises are helpful to lubricate joints, purge and guide Qi through dance. c) Health Qigong Shi Er Duan Jin, a sophisticated blend combining the essence of the ancient schools. This form is a system of sitting postures exercises which are done in order of head, neck, shoulders, back, waist, upper limbs, lower limbs, chest and abdomen. *Note: For those taking the 250 and 500HR Yoga Teacher Training, you will be certified in Health Qigong.